It has been raining all week here in the Midwest and doesn’t show any signs of stopping until the middle of the week next week! As a result I have been loving wearing my Joule’s raincoat. It is just the perfect look for these rainy days, the yellow is like a ray of sunshine making you happy and the coat itself is just perfect for staying warm and dry. 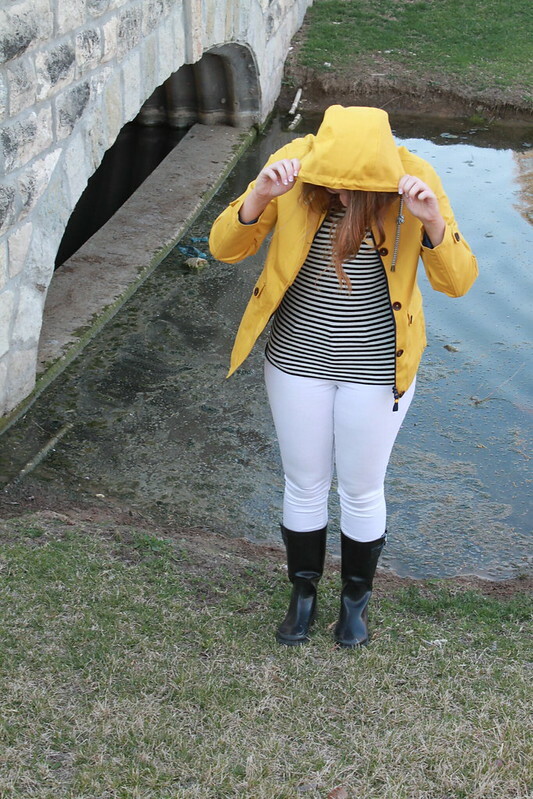 I am in love with this adorable striped raincoat from Talbots. I wish I had an excuse to add another raincoat to my collection, but unfortunately can’t justify buying another one. That doesn’t stop me from dreaming over this one and keeping an eye on it hoping it will go on sale enough to justify the purchase! I am a huge Fixer Upper fan, but due to the fact that I only recently got cable missed out on the earlier seasons. I was so excited to find a lot of seasons on HGTV’s website and have been devouring both the old and new ones! I received this devotional book for Christmas and have been loving it. Every day has a new devotion and they are all so relevant. I know that I am going to be encouraged every morning and it is the perfect book to start my quiet time out with before digging into the Bible. This camera bag is so cute for a smaller camera bag with a retro flare to it. As I told you last week, I honestly was born in the wrong era and love anything and everything vintage, so I am totally drooling over this camera bag. It would look so darling with the retro camera I shared with you last week! Bonus points for the fact that it is actually quite affordable. I know this video is a little over a month old, but I just had to share it still. If you couldn’t tell by the name of my blog, I love dance, especially ballet and I love it that the dads are getting involved! The little girls are so cute and you can’t help but giggle as your heart melts watching the dads join their daughters in their world.